Philadelphia, Pennsylvania, is 95 miles southwest of Manhattan, New York. There are several transportation options to get to and from New York City and Philadelphia. Consider the pros and cons of each option to choose the best transportation option for you.﻿ Advanced booking of many of these options may get you additional savings. 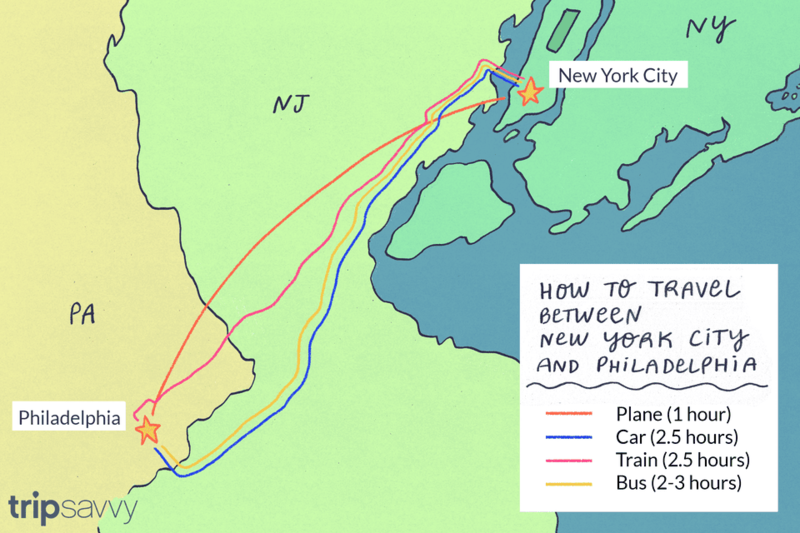 A day trip from New York City to Philadelphia is doable. It might be best to spend at least one night there to make travel worthwhile and enable you to get a taste of Philadelphia. Philadelphia is home to the Liberty Bell, Constitution Hall, and is famous for their namesake cheesesteaks. Traveling to Philadelphia by train from New York City is a quick, low-stress option. Trains travel from Penn Station in Manhattan to Philadelphia's 30th Street Station. Amtrak's Acela service takes just over an hour, while other trains take about an hour and a half. You can purchase tickets in advance by Amtrak or in person at Penn Station. Fares range from about $39 to $175, depending on the schedule. The most affordable fares are available when you purchase your tickets two weeks or more in advance. Budget-conscious travelers might prefer to take NJ Transit to Trenton. From there, you transfer to the SEPTA train to Philadelphia. The change is easy since it is just across the track. The trip takes longer, nearly 2.5 hours, but it costs less, about $20. The biggest advantage to traveling this way is that Amtrak is quick and direct, although Amtrak is pricey. NJ Transit is less expensive than Amtrak, takes an hour longer, and is more expensive than the bus, which takes about the same amount of time. Most of the trains offer wifi service. Bus service from New York City to Philadelphia is an easy, affordable option for visitors. The trip takes about two to three hours, depending on the traffic. Greyhound departs from within Port Authority Bus Terminal, while other bus services, like Bolt Bus and Mega Bus, depart curbside. Each company offers about 20 departure times. Confirm where your bus will depart from so you can be in the right place at the right time. Purchase your tickets in advance online to get the best fares. Fares range from $10 to $20. Some bus companies have service from downtown Manhattan as well. The biggest advantage to bus travel is that it is cheap and has frequent departures. Most of the buses offer wifi services. The biggest disadvantage is that traffic can sometimes be unpredictable and it is not as comfortable as the train. You can drive from New York City to Philadelphia—the most direct route takes you through New Jersey on I-95 or the New Jersey Turnpike, and it is about 95 miles. For most visitors without a car, it does not make a lot of sense to rent a car, since you might not need a car in either city and parking can be difficult and expensive. Although the drive is only 95 miles, you should plan on the trip taking about two-and-a-half hours, since stops and traffic can add to the overall time. You can rent cars in Manhattan, although the rates at the airport tend to be cheaper. The biggest advantage to travel via car is that it can be a good value if you are traveling with a group, and there is no schedule to adhere to. Besides car rental being pricey, traffic and parking in either city can be a hassle. Flying to Philadelphia is the fastest way to travel, with the flight taking just an hour, but that doesn't include time spent getting to and from the airport, checking bags, and clearing security. That said, shuttle flights from New York City to Philly can sometimes be cheaper than the train and run frequently. Philadelphia International Airport is the closest and most convenient airport to downtown Philadelphia. The SEPTA train runs from the airport to Center City. Travel by plane can be an advantage because it is fast, and can be less expensive than the train. Often the biggest disadvantages are dealing with airport hassles and getting to and from the airport.